Back when I used to go to Cruisers Forum regularly, there was a guy on there with the handle of MarkJ. From what I gathered, MarkJ was Australian, spent his winters in St. Martin, and headed north every hurricane season. He seemed like a character of the first order and was a bit of a legend on the site. In fact, others probably talked more about MarkJ on Cruisers Forum than MarkJ actually posted, even though he was a frequent contributor. Amongst these posters, MarkJ had a reputation for being a ladies’ man with a girlfriend or three in every port, coming and going from his Beneteau 393, Sea Life, at all hours of the day and night. Of course, MarkJ did nothing to disabuse anyone of this image. 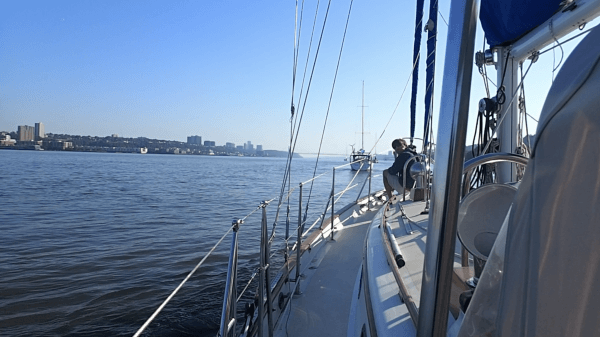 Two years ago, on the first morning we were on the ball at the 79th Street Boat Basin, Margaret noticed a Beneteau, rocking and rolling in the Hudson. The boat had come in the night before, but what caught Margaret’s eye was the yellow Q flag flying at the spreader. As we chatted about where the boat might have come from, a guy got off the boat and into his dinghy. As he motored towards the boat basin, he swung by Bear, introducing, with an Australian accent, himself as Mark. As he good-naturedly flirted with Margaret and gave me a couple winks on the side, he told us how he had been coming up from St. Martin, but had to put into Bermuda because of some storms that had passed off the coast. 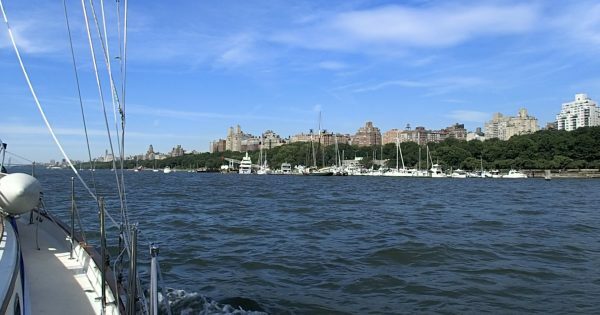 He now planned to spend the summer on the mooring here in New York City, as he often did. After Mark left us, I started to put the pieces together in my head. And as we sat there making plans for the day, I related the legend of MarkJ to Margaret. Before we left, the tide changed, and we could read the Beneteau’s name on the transom, Sea Life, confirming Mark’s identity. Over the next week, we did not say more than a passing hello to Mark, but Margaret and I spent a lot of time observing his activity and laughing about whether his reputation was well deserved or horribly misguided. For instance, later that day we saw Mark bring a lady and her large piece of luggage back to the boat. In the coming days, there were other late night comings and goings with a woman on the dinghy and quite a few mid-morning ones too. And towards the end of our stay, we witnessed Mark and a younger lady come off the boat with another large piece of luggage. Now was this all the same woman or a parade of different ladies? And if it was just a single woman, was it a lady-friend or maybe Mark’s sister who had come to New York from Australia for a visit? We never figured any of it out, but we certainly enjoyed debating the issue and watching the activity, as we always do in a good mooring field or anchorage, though usually the activity involves birds and marine life. Regardless, we hope the legend of MarkJ lives on. LOL nothing less from an Aussie fella! Crikey everyone knows they love there sheila’s! I’ve been following Mark of SeaLife… or at least his AIS. Still out cruising.